With the world’s attention diverted to Venezuela, whose democratically elected ‘dictator’, Hugo Chavez, has not renewed the license of a broadcaster implicated in the 2002 coup that briefly overthrew the elected government and replaced it with a ‘democratic’ junta more to Washington’s liking, Pakistan’s actual military dictator, General Pervez Musharraf, yesterday provided new powers to the Pakistan Electronic Media Regulatory Authority (PEMRA). The ordinance authorises the Pemra to confiscate the equipment of broadcasters and seal the premises without consulting a council of complaints. The council was envisaged in the amendments passed in February. The amendment increased the fine for violators to Rs10 million from the existing Rs1 million. Freedom of expression as understood in Pakistan precludes criticism of the military or the judiciary, so that is the context in which to construe the expression ‘operating illegally’. Two privately owned television stations, Aaj [‘today’] and ARY One World, had already been denied permission to do live broadcasts under existing rules. As soon as the new ordinance was announced, journalists took to the streets of Islamabad. …that the new federal budget would be a catalyst in bringing about a qualitative change in the life of the poor and ensuring fast economic development. He said poverty would be brought down and job opportunities created through a record Public Sector Development Programme. He said massive economic development activities would be generated as a result of massive allocations for various development projects. 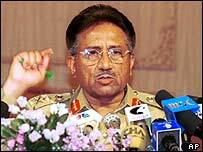 President Musharraf said the country had achieved record economic growth. He underlined the need for transferring the benefits of development to people at the grass-root level. He said measures would be taken to ensure the availability of essential items at subsidised rates. He said steps were being taken to check price hike, especially of items of daily use. He said measures would be taken to check inflation. He said salaries and pensions of government employees would be increased. Doubtless such vacuous promises are very welcome in a country where 65.6% of the population live on less than US$2 per day and 13.4% under $1. A full 26% are under Pakistan’s own poverty line. Which is not really surprising when cops get Rs3000 (US$50) per month and a primary school teacher can earn as little as Rs1200 ($20) a month. In an apparent rebuff to General Musharraf, Dawn reported that yesterday, the Supreme Court ‘turned down federal government’s request for initiating contempt of the court proceedings against the Supreme Court Bar Association (SCBA) for defaming the judiciary and military at a seminar’. I hate to delete comments, but please - NO ADVERTISING! Not even in Portuguese. Not even for personalised t-shirts.